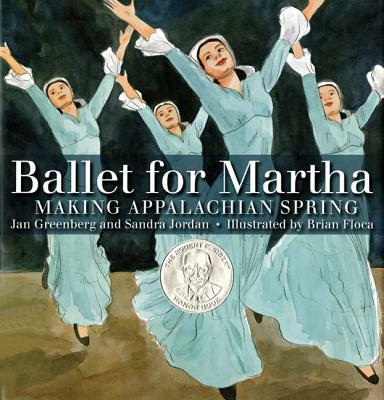 Award-winning authors Jan Greenberg and Sandra Jordan tell the story behind the scenes of the collaboration that created APPALACHIAN SPRING, from its inception through the score's composition to Martha's intense rehearsal process. The authors' collaborator is two-time Sibert Honor winner Brian Floca, whose vivid watercolors bring both the process and the performance to life. Brian Floca was born and raised in Temple, Texas. He attended college at Brown University, where he double majored in art and history, cartooned for the school newspaper, and took classes down College Hill at the Rhode Island School of Design. One of his instructors at RISD was author and illustrator David Macaulay, who introduced him to author Avi. That led to a collaboration with Avi and editor Richard Jackson on the graphic novel City of Light, City of Dark. From there, he went on to illustrate additional stories by Avi and other authors, to continue studying art (including an MFA from the School of Visual Arts in New York), and to write and illustrate books of his own. Brian's books include Moonshot: The Flight of Apollo 11, Avi's Poppy and Ereth, Patricia MacLachlan's The True Gift, and, Ballet For Martha, a picture book by Jan Greenberg and Sandra Jordan. He's working now on his next book as author and illustrator. He lives in Brooklyn, New York.